Well folks, the verdict is in. I just heard back from WotC. There will be no new issues of the Frontier Explorer or Star Frontiersman. I disagree with their reasoning behind it and may be able to change their mind in the future but for now I will be complying with with their wishes. Also, I'll need to pull the remastered digital maps that i created (Port Loren, KH station deck plan, Town map, and the original Assault Scout deck plans). Since these were designed to be near exact replicas of the originals, this is understandable. Everything else already published stays up! I don't have to pull the websites or already published materials down. I cannot express how happy this makes me as I had feared the worst. The efforts of everyone who created content for the magazine will stay on-line for everyone to enjoy. For the issues of the Star Frontiersman that I had to pull, I'll be removing the Dragon articles and reposting them over the next few weeks. I also don't have to pull out the original artwork that was used in any of the magazines. I was given permission to keep all that up. I'm waiting to hear if I actually need to pull the material off of DriveThruRPG or not. The answer I got to that question wasn't clear. Even if I do, they will stay up on the websites. I'll be making a few changes to the website, primarily pulling the "Submit New Content" button and the Patreon link. Beyond that there probably won't be to many changes expect that I'll be pulling the site off an external hosting provider back to my home server. I also need to decide what we're going to do with the material in the submission queue that we didn't get to publish. Most likely it will get edited into a on-line edition here on the website, but not put together into a complete PDF download. Thank you to everyone who has supported the Frontier Explorer over the years whether as authors, artists, or just readers. I was hoping to get to at least 25 issues to match the Star Frontiersman but we came close with 23 issues (although if you count the two technical manuals ...). I haven't decided what I'll work on next, the Frontier Explorer has consumed most of my free time over the past (nearly) 6 years since Thomas Verreault Jr and I started working on it back in April of 2012. I know some of my time will be spent on material for FrontierSpace as I'm working on a module with Bill Logan and editing one for Trevor Holman. But I'll definitely be working on more Star Frontiers material as well. The truth is I have a huge todo list. I just need to decided where to focus (one of those is getting all the back issues put up as individual on-line articles). As promised, here's the next session, recorded Feb 23, 2018. In this session, the PCs get word of another attack of a set of four quickdeaths like they saw in the village but this time at the zoo in Point True. There is a lead on their source and the PCs are sent to investigate. It doesn't turn up much but while there, they witness what appears to be a starship making an emergency landing and possibly crashing. Radioing it in, they are sent to investigate, locate the downed ship and help the survivors. Next session will be Friday, March 9th @ 8pm MST. If you want to follow along live, we stream on Twitch. I've gotten a bit behind posting these as this one was recorded over a month ago! I have one more session in the queue that will be posted soon and we have our next session this Friday. I'll try to be better about getting it up sooner after recording. In this session, the PCs continue exploring the Sathar cave, capture a few more sathar, kill some cybernuks, and then decide that there are probably too many more sathar deeper in for them to handle and call for backup. They return to Point True for a debrief and some much needed rest. Additionally, this session suffers from a serious audio problem. At about the hour and a half mark, my (the GM's) audio cuts out, and remains out until about the 3 hour mark. You can still hear the PCs but can't hear my descriptions. I'm not sure exactly what happened. Last week I was contacted by WotC informing me that they were teminating my permissions to publish mateiral from the Star Frontiers game. Talking to them on the phone, it sounded like they wanted me to remove everything and stop publication of the magazines. However, the way the actual documenation was worded, it seemed to only relate to the publication of the original rules, modules, and Dragon magazine articles. If the latter is the case, it should have no impact on the Frontier Explorer. If the former, then the material on this site will be going away. While I'm hoping there is no impact, more likely what we can achieve is some middle ground where what has already been published will be allowed to stay on-line while we are asked to not produce any new issues. I'm still waiting on clarification from WotC as to their intent. In light of recent developments with the trademark application by Evil Hat and the release by WotC of the PDF and print-on-demand versions of the original materials on DriveThruRPG, this development is unsurprising and completely within their rights as the copyright holder. At the very least, the remastered rules, modules, and Star Frontiersman issues that contain Dragon magazine articles will be removed from the Star Frontiersman site by the end of the week. Beyond that, things are in limbo while I await clarification from WotC. However, if you want to be safe, download a copy of all the magzine issues to a local drive so you have them even if we have to take them off-line. I'll keep everyone informed as I learn more. In this sessions, the PCs have a quickdeath BBQ, start tracking where the quickdeaths came from, meet up with a bounty hunter who was also tracking the quickdeaths, and discover what appears to be a sathar lair. I just received my print proof for issue 23 and it looks great. 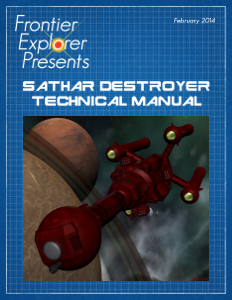 If you like the Frontier Explorer in physical form, the print-on-demand version is now availble through DriveThruRPG. Just follow the link to the product page and place your order. The at cost price of the print edition is $7.23. Issue 23 of the Frontier Explorer in now available for download. This issue focuses on Clarion Station and all the things to see and do there. As part of our Warriors of White Light challenge, we have a couple of articles detailing the home of the Clarion Royal Marines. The other feature article in this issues is one detailing a conversion of the Star Frontiers races to the new FrontierSpace RPG. The Frontier Explorer is now listed as a “Pay What You Want” product on DriveThruRPG. As always, the Frontier Explorer is free (and always will be) and you don’t have to feel guilty about just downloading it and enjoying it for free. Please do. That said, if you want to help support the magazine, the pay what you want option allows you to make a contribution. Think of it as a “tip jar” or donation plate. Just don’t feel like you need to make a contribution. If you want to be a regular supporter, you might consider supporting our Patreon campaign as that not only helps support the magazine, it gets you early access to some of the articles and to each finished issue about a week before it becomes generally available (details on Patreon are in the issue). In this episode, the PCs wonder if they are confusing themselves but find some solid leads and set some traps for the parties responsible for the missing materals and refine their suspect list a bit. We had a bit of computer trouble in this session (including the recording computer crashing about half way through) so the audio isn't as clean as it should be. Bear with us, we're still getting the hang of this.